ROUND two of the Victorian Football League (VFL) Women’s produced many highlights, with some teams experiencing victory for the first time while others had to deal with the odd feeling of a draw. But no matter what the result was, the entertainment was still top notch across all games. We were at three games on the weekend and took down notes on some of the top performers. She was a constant contributor all day for Richmond, finishing with 18 touches. She was the link from midfield to forward many times, and went inside 50 four times. She applied really good forward pressure. She was rewarded for her good work with a shot on goal from a free kick from the square but it hit the post. Very good tackler and won herself a free for holding the ball in a chase-down tackle early in the first term. The Giant played mostly in attack, and set up many attempts on goal. Although none prevailed, she still had a serviceable game with 10 disposals. Her pressure was huge and exemplified by her tackling. She finished with 11 tackles, the most on the ground. She was the Tigers best and most influential in the midfield, with 25 disposals for the match. Although she did not score any goals this week, she can hold her head up high. She presented well at the ball and she was able to mark the ball on the lead from 50 metres out. She kicked a goal off one step from the long range to start the game. She repeated this a minute later with another contested grab and goal from 50 metres. She kicked her third for the quarter when she was left out the back and waltzed into an open goal square. Mouncey took another mark on the lead but could not convert, with her shot off a few steps hitting the post. She set up her teammate in the last for a goal with a really clever piece of play hitting her on the chest 50 metres away. She played at full-back and played more of a quarter-back role as she always stayed at least a kick behind the play and time after time the Tigers midfielders kicked it straight to her. McDonald was the best midfielder on the day for the Falcons finishing with 23 disposals. Her teammates always tried to get the ball in her hands as she is a very good kick. She kicked the ball 14 times on the day. Kicked a good snap from the boundary early in the first after a kick-in mistake from the Tigers. She had a shot from general play, which didn’t go through as it hit the post. She intercepted a Tiger seconds later and it was the same result, a behind. Dominated the ruck and even brought out a don’t argue! She also managed to get a lot of the ball around the ground as she finished with 17 disposals. Took a lovely one-on-one mark and earned a 50 metre penalty. She made no mistake from close range and slotted through the Blues’ third goal of the match. Took a great mark in the goal-square, and almost had to wrestle it from Celine Moody! Kicked her second goal of the game in this instance. Ran hard all day and got some nice kicks away. Uses the ball with precision and kicks deftly, never having to rush. Read the bounce of the ball perfectly and sent it back into the Blues’ forward 50 when it looked like the Bulldogs were going to slingshot it towards their goal. Did everything she could to trap the ball inside the boundary line and just generally tried hard all game. She got plenty of the footy and chased it down wherever it went. She didn’t give up all day. Kicked a great goal to begin the last quarter and celebrated in style. Looked like she was really enjoying herself out there. Hosking was at the bottom of every pack, showing her determination to get the footy. Had a brilliant day out, kicking the last goal of the game for the Blues after marking it straight in front to give herself a nice set-shot. Has excellent run and carry for her height and is another Carlton player that’s a fighter. Produced a nice passage of run and carry and when the bounce didn’t go her way, she kept moving it forward instead of giving up on it, soccering it forward. Took a sensational mark on the lead in the third quarter. She kicked truly from a set shot and kept Carlton’s momentum going. Her goal gave them their biggest lead of the match at the time, which was 31 points. Had great awareness to see that the kick was dropping short from a set-shot and marked out on the lead from close range. Had a really good day in the forward line, finishing off her work with a play-on mark from the goalsquare. This resulted in her second goal of the day. Picked the ball up nicely and hit a target well. Got a good kick away while being tackled. Took a great mark on the lead in defence with a couple of players pushing and shoving her. Took a nice intercept mark that saved a forward 50 entry for the Blues. Followed up the ball well when it was on the ground and didn’t give up on it despite it rolling away. Got a high free kick while she pursued the ball, so she got reward for her efforts. Lead to the ball well in defence to ensure that the Carlton forwards didn’t. Read it best in that instance, and was generally good at reading the play throughout the afternoon. Wildes made history! She kicked the Bulldogs’ first ever VFLW goal from a tight angle on the boundary line. When it sailed through, the players sure got around her! Also produced great run and carry where she backed herself to take a couple of bounces. This created an inside 50 entry for the Dogs. She looks like she’s fitting in well at this level. Really proactive around the ground and with the ball in hand. Took a great one-on-one mark in the centre square. Executed a great side-step and big kick inside 50 off one step. Executed brilliant run and carry. Backed herself to run away with it. She was proactive when she got the ball and always had the intent to use it cleanly. She was a solid presence around the ground for the Bulldogs. 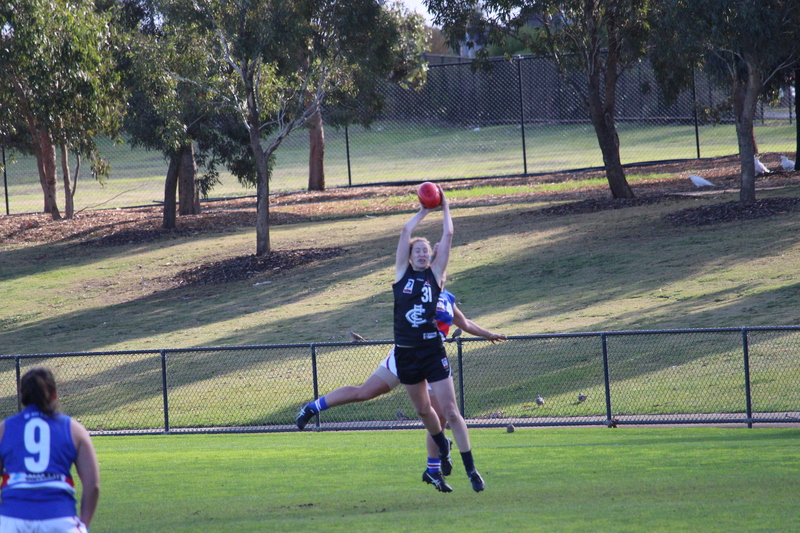 Did well to prevent a Darcy Vescio mark then followed up the spilled ball to get a kick away out of defensive 50. Did some nice things in defensive 50 and was able to accumulate the ball. D’Arcy consistently went in hard to win the footy at ground level, getting down low to get first hands at it. She was never far from the contest and used her long clearing kick to help propel her team out of defence. Lambert was at her usual best, showcasing her clean pick-ups at the coalface and opening up space to try and create a good spread across the ground. She impressed with her ability to breaks line and shrug off tackles while using her explosive speed through the middle of the ground to propel the Pies forward. Lambert was not afraid to scrap hard to win the footy and was a real play-maker for the Pies. She particularly instrumental in the middle of the ground. Put out a complete performance for the Pies, helping to create forward thrusts for her teammates. She competed hard in and around the stoppages and showcased her clean hands which was important for Collingwood. Nash was inspirational up forward for the Pies. She showcased her footy smarts and ability to read the play getting into damaging positions across the field. Fowler competed well in the ruck, showcasing her impressive lead and ability to read the flight of the footy. She won a few taps to advantage which allowed her midfielders to run onto the footy and break through the packs. Fowler’s follow-up work was really good as well. Orr was a playmaker for Geelong, showcasing her footy smarts and ability to hit targets even when under pressure. She impressed with her willingness to go hard at the footy and imposed herself at the contest, laying strong tackles. Opened the Cats’ goal-scoring account, kicking the first major of the game in the second quarter. She worked hard all game and committed herself to winning the footy. She provided some good run and carry for the Cats and really opened up space in the middle. Having to compete with the wind, she impressed with her strong kick which helped to propel her team forward. Cranston was a tackling beast in the first quarter of the game applying heaps of physical pressure on her opponents causing them to turn the footy over. She laid an impressive tackle in the first quarter leading to a holding the ball free kick, allowing the Cats to try and create some forward momentum. She made the most of her strong booming kick and played on quickly to help keep the game moving. McDonald was really clean out of defence and thought her way out of trouble. She used her speed to evade on coming players and highlighted her footy smarts and composure to hit targets even while under pressure. She was strong up forward took a strong contested mark in the opening quarter to help set the tone of the match. Dhamarrandji impressed with her follow-up work at ground level and fight to win the ball and dish it out to her teammates. ROUND two is here and it brings plenty of intriguing match-ups across the board. We preview each match and tell you which players to look out for. Two big names are making debuts for their respected sides at Windy Hill. One is a well-known name while the other is a name we will all come to know very shortly. AFLW best and fairest, Emma Kearney will run out for her first game with Melbourne Uni this year on Saturday. Kearney swapped the red, white and blue for the blue and white stripes in the AFLW off-season, and would be keen to continue to display the blistering form that we saw in the AFLW. Kendra Heil is the other notable debutant, as she hails from Canada and made her way onto an AFLW list. Heil was drafted to Collingwood but a knee injury cut her AFLW career short. She now has the opportunity to show what she’s made of in the red and black on Saturday. Richmond are coming off a big round one win while Darebin suffered a shock loss. The Tigers have co vice-captain, Kate Dixon to thank for this, as she kicked four goals in the win over the Bulldogs. This week, she will be joined by GWS AFLW star, Louise Stephenson, who played two games for the Giants this year. They will both line up in the forward line and could be a formidable duo. Darebin have responded by throwing former Ainslie footballer, Hannah Mouncey in the back pocket. Mouncey began her career at Darebin at full-forward last week and kicked a goal. AFLW stars, Lauren Pearce and Nat Exon are the notable ins for the Falcons. Pearce strung together a few good games towards the end of the AFLW season for the Dees while Exon was consistent as ever in the Lions midfield. Casey have hired new coach, Damien Keeping to lead the Dees brigade against a Hawthorn team that came off a big round one win. Keeping has not held back in his first round of selection, bringing in plenty of Melbourne AFLW players to combat Hawthorn’s fire-power. The Demons boast an all-AFLW half-back line with Jasmine Grierson, Harriet Cordner and Darcy Guttridge all looking to make their presence known at Casey Fields. However, the Hawks also boast a dangerous back line, with Meg Hutchins, Pepa Randall and Melissa Kuys all lining up in the defensive half. But Hawthorn’s midfield could be the difference in this game, with Julia Crockett-Grills and captain, Emma Mackie coming off stunning round one performances. Also be sure to keep an eye out for the duo of GWS’ Phoebe McWIliams and former Eastern Ranges player, Olivia Flanagan, who will feature in Hawthorn’s forward line yet again. Last time Carlton played the Bulldogs in the AFLW, Brooke Lochland kicked seven goals. But the Bulldogs are without her amongst other important AFLW stars while Carlton is flying high after a round one win. The Blues will be without Sarah Hosking this weekend but you wouldn’t even know, as Jess Hosking will be out there at RAMS Arena and is likely to bring the same aggression as her sister. Be sure to keep an eye out on Darcy Vescio in the forward line, who found some form last week with two goals and 17 disposals after a quiet season in the AFLW by her standards. The Bulldogs have bolstered their midfield this week, bringing a current and former AFLW star into their round two line-up. Kimberley Rennie, Bailey Hunt and Hayley Wildes all featured in the Bulldogs’ premiership year and will be joined by Collingwood retiree, Bree White, who is an experienced star. Be sure to look out for debutant, Tara Morgan, who is likely to have the match-up on the dangerous Darcy Vescio on Sunday. Both teams are coming into round two searching for a win, after the Seagulls went down to the Pies and the Saints went down to the Blues. Williamstown have left Jasmine Garner out of its round two side despite a wonderful performance last week. Garner played in the forward line for most of the game but was able to go back in the last quarter and make an impact. 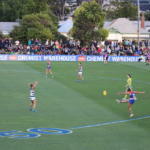 The Seagulls have still included Garner’s AFLW teammate, Jess Duffin in the side, who relished in her role through the middle of the ground. Bulldogs premiership player, Jenna Bruton is also a notable out, so it will certainly be a challenge for the Seagulls on Sunday. That’s because midfielder, Alison Drennan kicked off her season perfectly with a dominant display in the midfield. Drennan collected 15 disposals and laid 11 tackles against the Blues and would love to have a repeat performance at Williamstown. Also be sure to keep an eye out for Samantha Johnson, who complemented Drennan well with 16 disposals and three marks. While the men go head-to-head at the MCG, the women will take centre-stage just outside at Olympic Park Oval. The Pies are coming off a close win against the Seagulls and their AFLW stars stood up in the performance. Sarah Dargan starred in the midfield with 24 disposals and six tackles while Sarah D’Arcy was a solid contributor in defence with 17 disposals and eight marks. Dargan and D’Arcy would be hoping to build on these performances against a formidable Geelong outfit. 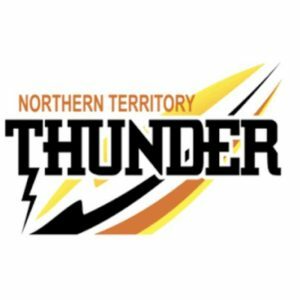 The Cats have brought in a name that we will all come to learn in time, with Northern Territory player, Evelyn Dhamarrandji coming into their round two side. She will play in the forward line alongside Kate Darby, who has been in some nice form as of late. Richelle Cranston and Rebecca Garing will be the ones to look out for, as they dominated the midfield last week with 30 disposals and 20 disposals respectively. ROUND two sees plenty of big AFLW names play their first game in the new-look Victorian Football League (VFL) Women’s competition. We will also get to have a look at the Casey Demons this round, as they had the bye in round one. There are big matches across the board this week and the teams have brought in the big guns to give us another entertaining round of football. Essendon have selected Canadian, Kendra Heil for its round two encounter against Melbourne Uni. Heil was formerly on Collingwood’s AFLW list and previously played at Eastern Devils. GWS midfielder, Maddy Collier and West Australian, Courtney Ugle will also pull on the red and black at Windy Hill. AFLW best and fairest, Emma Kearney will suit up for Melbourne Uni for the first time this year, after a busy off-season for her. 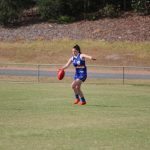 Rhiannon Green, Airlie Runnalls and Candice Adams are among the other ins to take on the Bombers. Richmond have brought in GWS’ Louise Stephenson and Collingwood AFLW star, Lauren Tesoriero for the clash against the Falcons, Stephenson has been named in the forward line, alongside Tigers co vice-captain, Kate Dixon, who is fresh off a four-goal performance. Georgia Fisher and Grace Bibby are among the lucky ones to be included for the match at Swinburne Centre. Four AFLW powerhouses in Lauren Pearce, Karen Paxman, Nat Exon and Aasta O’Connor come into Darebin’s round two side. The Falcons have also listed forward, Hannah Mouncey in the back pocket in an interesting positional change. 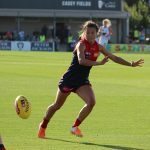 The Casey Demons play their first game in the VFL Women’s competition, and have some exciting players lining up in red and blue. Melbourne AFLW players, Harriet Cordner, Jasmine Grierson, Kate Hore, Eden Zanker, Aliesha Newman, Laura Duryea and Katherine Smith will all line up for the Demons on Sunday. They will be joined by former Gippsland star, Darcy Guttridge, who has swapped the black and white in the AFLW for red and blue in the VFLW. After a big win against the Bombers, the Hawks have brought in four players in the hope of making it two from two in the competition. Chantella Perera, Dianna Haines, Jess Foster and Sarah McNamara all come into the side for the big clash at Casey Fields. Carlton have rotated their AFLW players for the clash against the Bulldogs, as Sarah Hosking and Madeline Keryk make way for Kate Shierlaw, Reni Hicks, Jess Hosking and Sarah Last. But all eyes will be on Rugby 7s gold medalist, Chloe Dalton, who will make her VFLW debut on Sunday. Dalton will start in the back line for the clash at RAMS Arena. The Western Bulldogs have matched Carlton’s long list of AFLW ins by bringing in Bailey Hunt, Kimberley Rennie and Bree White. 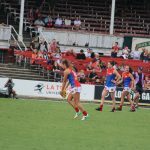 Hunt and Rennie featured in the Bulldogs’ premiership-winning year while White announced her AFLW retirement at the end of last year after playing some great football with the Pies. Tara Morgan and Natalie Gills are among the other ins who will pull on the red, white and blue on Sunday. Williamstown come into the clash against the Southern Saints without Bulldogs AFLW midfielder, Jenna Bruton and Collingwood AFLW forward-turned-defender, Jasmine Garner. However, the Seagulls have brought in plenty of players in the hope of getting their first VFLW win. Sally Seabrook, Caitlyn Balshaw, Nikki Wallace, and Kaitlin Smith will all have the opportunity to run out for the Seagulls on Saturday. The Southern Saints have also welcomed in a host of changes as they also search for their first win in the competition. Megan Supple, Isabel Quintal, and Kelly Thompson have all been selected for the round two side. Collingwood go into the clash at Olympic Park Oval with a strong lineup, keeping all of their AFLW players in the round two side. The Pies have brought in Chloe Leighton to complement their AFLW stars in what should be a great contest against the Cats. Geelong has welcomed an exciting player from the Northern Territory, Evelyn Dhamarrandji, who will a player to watch throughout the VFLW season. She will be joined by Laura Taylor and Bianca Cheever in the round two side.